Microsoft's much-touted New Xbox Experience launches tomorrow, featuring Mii-like cutesy avatars, with the company offering free memory cards and discounted hard drives to tempt more consumers in. Xbox Live's one and only Major Nelson revealed last month that the New Xbox Experience will need at least 128MB of available storage to work. "The new Xbox experience will require 128MB of free space," Microsoft confirmed with TechRadar this week, adding that, "a hard drive is recommended for the optimal experience, to take advantage of some new features, and to be able to enjoy the great movies, TV shows and games available on Xbox LIVE. "While we expect the majority of consumers to download the New Xbox Experience without a problem, a small percentage of Xbox 360 owners may not have enough memory to accommodate the update. "To help ensure all Xbox LIVE members are able to download the New Xbox Experience and enjoy its new features, Microsoft will be offering storage solutions to the Xbox LIVE community. We are not sharing details of this offering yet. Be sure to check xbox.com for more details in the coming weeks. 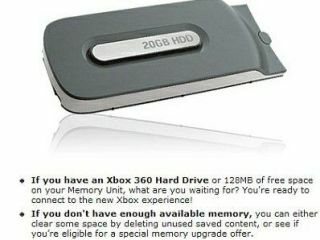 So, presumably, Microsoft UK will be launching a similar Xbox 360 Memory Upgrade Program to that already launched over the pond in the US, where our American cousins are being offered the option of free 512MB MU's or $20 20GB HDDs (for Core owners) and $30 20GB HDD with 3 months of Xbox Live Gold package (for Arcade owners). To apply, US gamers are merely required to pop their serial number and console ID into the registration website.